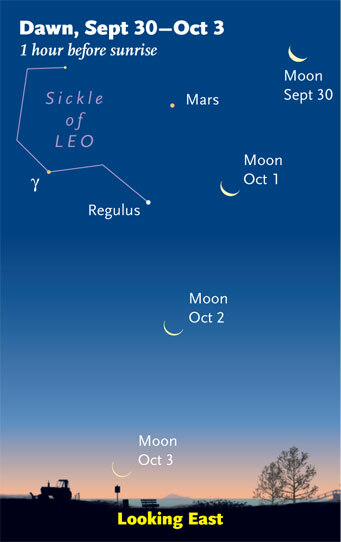 From “This Week’s Sky at a Glance” at SkyandTelescope.com. 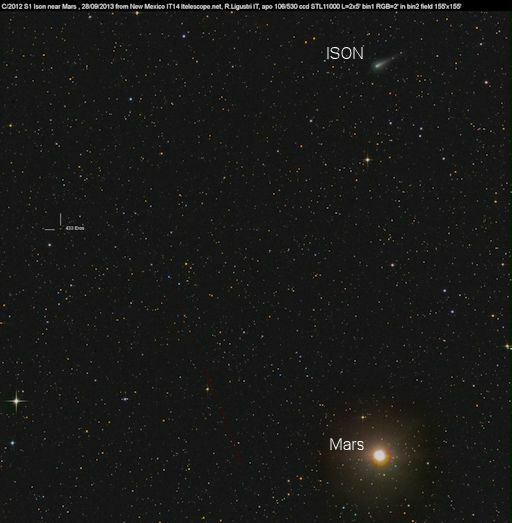 Also, Comet Ison will make its closest approach to Mars on October 1. This entry was posted in sky watching and tagged Comet Ison, Mars, the Moon on September 29, 2013 by Stewart Dale Spencer. 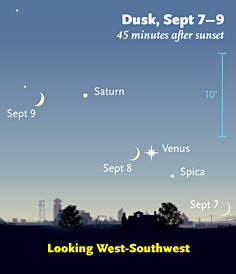 On Sunday, September 8th, a very thin crescent Moon joins dazzling Venus low in the western sky after sunset. Even folks with no interest in astronomy are impressed when there’s a tight pairing of two bright celestial objects. So keep an eye to the early-evening sky on Sunday, September 8th, and tell all your friends and relatives to do likewise. Soon after sunset, you’ll be rewarded with the dramatic pairing of a pretty crescent Moon paired closely with the dazzling planet Venus. This is one you won’t want to miss — these are the two brightest objects in the nighttime sky. This entry was posted in sky watching and tagged crescent moon and venus on September 7, 2013 by Stewart Dale Spencer. It’s Time for a Perseid Party! The Perseid meteor shower peaks this year when there’s almost no Moon, affording a dark sky for late-night shooting-star spectators and counters. A thick waxing crescent Moon sets in mid-evening, so it will offer little interference for this year’s event. Earth should go through the densest part of the stream for some hours on August 12th around 19h Universal Time, which is 3 p.m. Eastern Daylight Time. This means the shower’s peak splits the difference between the early-morning hours of August 12th and 13th for anyone in North America or Europe. So the number you count on each of those mornings, even in ideal conditions (no light pollution and the radiant nearly overhead) might not match the International Meteor Organization’s predicted peak of 100 per hour. But surprises can always happen. 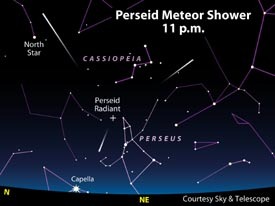 Perseid meteors can appear anywhere in the sky, but they appear to stream outward from a spot (called the radiant) in the constellation Perseus. Some Perseids appear beginning around 9 p.m., but they’re always better from about 11 p.m. or midnight until the first light of dawn. This is when the shower’s radiant point in northern Perseus climbs high in the northeastern sky. Or, to put it another way, this is when your side of Earth turns to face the oncoming meteor stream more directly. This entry was posted in sky watching on August 9, 2013 by Stewart Dale Spencer. 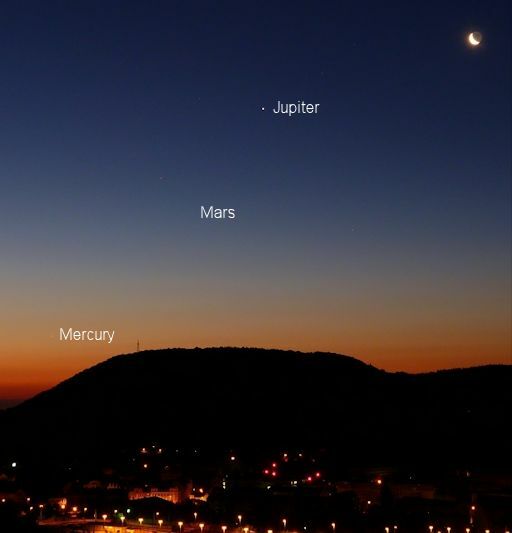 Don’t Miss the Morning Planets! On Sunday morning, August 4, the narrowing crescent will appear to the right of Mars. On Monday morning, August 5, the Moon will pass Mercury in deep-red twilight. Binoculars might be required for the Mercury passage. Warning: Do not point the optics at the rising sun. Set your alarm for dawn and enjoy the show! This entry was posted in sky watching and tagged skywatching on August 4, 2013 by Stewart Dale Spencer. A Reminder to Keep Looking Up! As I write this, a wonderful thunderstorm has just passed through Coupland. My granddaughter slept through the whole thing! Amazing. I haven’t see the rain gauge but I’m confident that it topped 1 inch and I’m hoping for more. Now, with our rain-cleared air, the next few days will be a good time to catch some shooting stars (a.k.a. meteors). This is just about the best time of year for meteors. 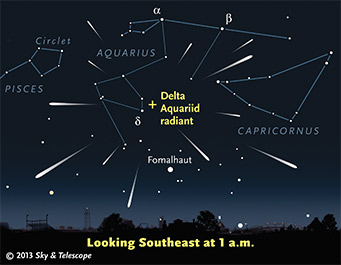 Check out this Sky & Telescope article (Catch a Shooting Star) about the Delta Aquariid meteors and the Perseid meteor shower, which peaks around August 12 and is my personal favorite. Whenever possible, I try to arrange to observe it from Garner State Park. If you are new to skywatching, the Sky & Telescope article, which is short but has lots of links for more information, will tell you everything you need to know to get the most out of the experience. Last year, gazing up from our back yard, we saw dozens of beautiful meteors on the peak night of the Perseids. The kids won’t be back in school yet so make it a family event they won’t soon forget. And even though we always need more rain, there is no shame in praying for clear skies and some stellar inspiration from time to time! This entry was posted in sky watching and tagged Coupland Texas, meteor showers on July 27, 2013 by Stewart Dale Spencer. Want to Get Into the Occult? Telescope users looking at the gibbous Moon from most of North America tonight can watch the Moon’s invisible dark limb creep up to and occult the 4.4-magnitude star Xi Ophiuchi. Only Florida and the West miss out. Some times of the star’s disappearance: in western Massachusetts, 12:38 a.m. EDT; Atlanta, 12:32 a.m. EDT; Chicago, 11:10 p.m. CDT; Winnipeg, 10:50 p.m. CDT; Kansas City, 11:00 p.m. CDT; Austin, 11:07 p.m. CDT; Denver, 9:39 p.m. MDT. Start watching early. I will be out with my telescope. Seeing an occultation is very cool. Let’s hope it’s clear! 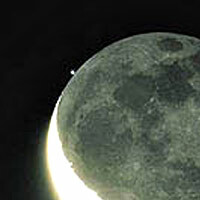 Here is an image of the Moon grazing the star Spica. This entry was posted in sky watching and tagged Coupland Texas, skywatching on July 19, 2013 by Stewart Dale Spencer.